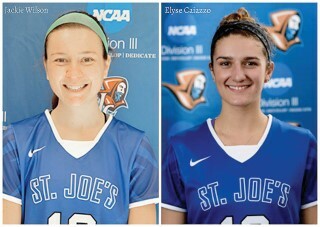 Lacrosse midfielders Jackie Wilson, a 2017 graduate and Elyse Caiazzo, a 2018 graduate, are the first players in the ten-year history of the St. Joseph’s College (SJC) Women’s Lacrosse Program to be named to the Intercollegiate Women's Lacrosse Coaches Association (IWLCA) Zag Sports Division III Academic Honor Roll. The IWLCA honored 532 student-athletes from 159 different institutions for this distinction in 2017. To be eligible for this honor, student-athletes must be a junior, senior, or graduate student and have earned a cumulative academic GPA of 3.50 or greater. Wilson (from Tiverton, Rhode Island) graduated with a nursing degree in May and was a three-time Great Northeast Athletic Conference (GNAC) All-Academic Team honoree. Caiazzo (from Cheverus High School alumna) is pursuing a double major in Environmental Science and Political Science. She is a two-time GNAC All-Academic Team honoree.